This category of our Top 5s is probably even more subjective than the rest, therefore even before revealing our rankings, we would like to clarify some things. For the purpose of our Top 5, we've considered four countries belonging to the Central European region - the Czech Republic, Slovakia, Poland and Hungary, which all share a common historical experience with communism that was only terminated in 1989. English books and English language itself were practically ordered out of these countries during the communist period. Since 1989, the situation has changed considerably and we thought it would be interesting to make you familiar with some of the results. Also, we've visited all the bookstores mentioned in this Top 5 personally (for further reading check out our Reports section) and the selection reflects our personal feel and other criteria, which you may find less relevant, so let us know if you have a different opinion. One more practical issue - our internal rule was to include at least one bookstore from each of the four countries that fell into consideration. As we've stated earlier, compiling this Top 5 hasn't been easy, but surprisingly enough, we had no doubts about the undisputed Nr. 1 (only the famous Massolit bookstore was an option we were considering for some time, but in the end we had to be true to ourselves...). This is not the most beautiful bookstore on this list, it doesn't have the biggest stock, there's nothing impressive about the interior and there's no cafe or any other in special feature. In fact there is nothing special about the Red Bus Bookstore, and yet it is a very special bookstore. Here are the arguments that support our Nr. 1 pick: We've never left this bookstore disappointed. We've never left this bookstore without a book. Sometimes, we actually had problems to leave at all... While browsing in Red Bus, you don't really need to look at the prices, since all the books range from 3 to 5 Euro, you like it, you buy it, it's that simple. The stock changes at a fast pace, so even if you visit on regular basis, there's always that thrill of browsing through books that haven't been there last month. There store is neither too big, neither too small, which contributes to the overall relaxed and friendly atmosphere. 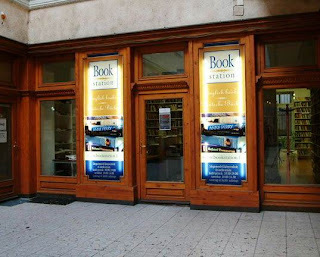 And last but not least, it is one of the first bookstores to appear on Bookstore Guide and as you have surely noticed, we're emotionally attached to it. As they say - beauty lies in simplicity, and that's exactly what the Red Bus Bookstore is, an honest second hand bookstore which are very rare these days. One of the most notable English language bookstores in Europe found its place at our spot number two - after having fought a vicious battle with our first discovered love at the top position. 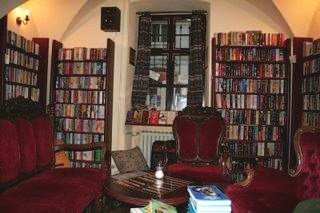 Converted from two apartments in a quiet part of Krakow and just a brisk 10 minute walk from the very town center, Massolit, is definitely both a heaven and a haven for all bookworms - it is a place known for its reputation of "sucking in" its customers and making them not want to leave for hours and hours upon their arrival, which is exactly what happened to your two humble narrators. 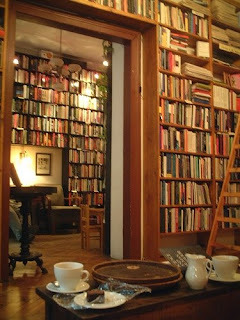 Upon entering, one is advised to take a look at the map of the store in order to orientate oneself - several rooms, all of which are furnished with classy looking top-to-bottom bookcases filled with books on almost any subject matter you can imagine. 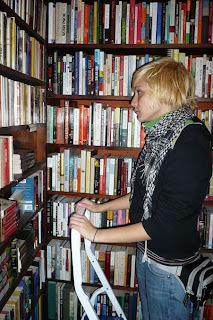 Massolit is a temporary home for over 25,000 titles (new and second-hand) at more than accessible prices, organized by subjects ranging from classic fiction to academic titles. They take a special pride in their selections of Women's, Jewish, Polish and Asian Studies and Central and East European literature. To make your bookbrowsing even more pleasurable, you can snuggle yourself in the comfortable armchairs and sofas, enjoy a cup of tea accompanied by fresh bagels and/or other home-made American goods. For closer feel check out the virtual tour on their website. Spot Nr. 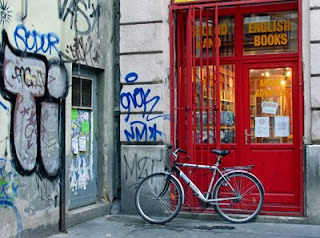 3 of our list is occupied by the only exclusively English second hand bookstore in Bratislava - Next Apache. And let us state very clearly that this bookstore would definitely not get lost even in a much tougher competition in Prague or Budapest. The combination of a bookstore with a cafe is not that unique anymore as you can see for yourself while browsing in our Guide. However, it's not so common to find a working example of this combination, where both of the elements are in balance and harmony. Next Apache has found its regulars who come there to enjoy the benefits of the bar, those who come and head straight to the shelves full of books and those who have a habit of doing both. And you feel absolutely c omfortable in any of these three cases. The first room of Next Apache with the dominant bar has the feel of a real cozy pub, while the second room with the comfortable red sofa looks like a nicely furnished living room full of books. And that's not it, there's a courtyard where you can sit and enjoy your drinks and books in the summer and another building where more English books are kept. 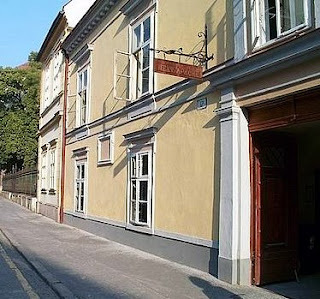 We also like the name of the bookstore and especially the story behind it (check out our post to find out more), so Nech sa páči - your Nr. 3 of our Top 5. 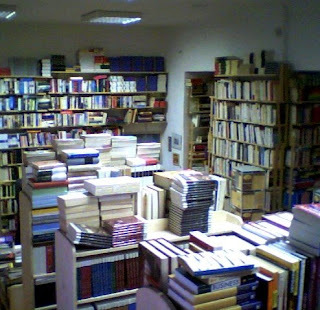 Although we visited only one of the two Prague locations Shakespeare and Sons managed to push its way through the rest of the bookstores and settled into position number four. 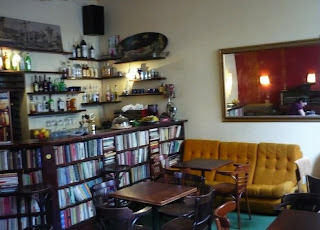 The store - the one tucked away in the small street of Krymska, just a bit farther away from the old center of Prague - is divided into two parts: the front being the cafe and the back room which stocks various new and second hand books. The whole rustic feeling with high ceilings, old shelves, squeaky floors and timeworn armchairs contributes to the atmosphere of this bookstore which bears the name of the most famous British playwright. Needless to say, Prague is an expensive city so it is not a surprise that the price range in this bookstore is a bit higher than one would ex pect in other Central European cities. However, when compared to the rest of the city, this bookstore is indeed one of the most accessible price-wise. All in all, Shakespeare and Sons is not a place you'll be leaving with several titles tucked under each arm (at least it wasn't our case), but we still think that the charming atmosphere and the interesting selection are well worth a visit. Having covered all four countries in the previous positions, one spot was left and it was tough to make a call. Then why did we choose to single out Bookstation? Simply because it is unbelievably stocked - with books in English, French, German, Spanish - it's a bookstore which definitely deserves more attention than it is receiving (perhaps due to being a bit remote from the very city center of Budapest, but, on the other hand, being located near the most busy train station - hence the name - Keleti Pályaudvar). Perhaps the only drawback of this bookstore is the lack of labeling into categories but still, it doesn't make your browsing any less interesting. You almost have a feeling that you are in a room of a mischievous teenager who refus on shelves, near the shelves and even behind the shelves. Be careful though, because you'des to tidy up his or her room on the mother's in vain requests: books lying on the floor, stacked probably be using a ladder to reach the ones on the top shelves. Oh, and needless to mention, the prices in this bookstore are more than friendly to your wallets. So, if you're planning on visiting Central Europe this year and you already have a fully planned itinerary, with not so much time to spare on bookbrowsing, but it is yet something that you utterly enjoy doing, we hope we narrowed down your selection by just a notch and thus saved you some time. Still, this does not, by any means, mean that you shouldn't go check out the other bookstores in these four countries - they are all special and unique in their own ways - and you can always disagree with our selection. If you do, don't hesitate to drop us a line. I love reading about communism,thanks for this post,You have really done lot of search on it. 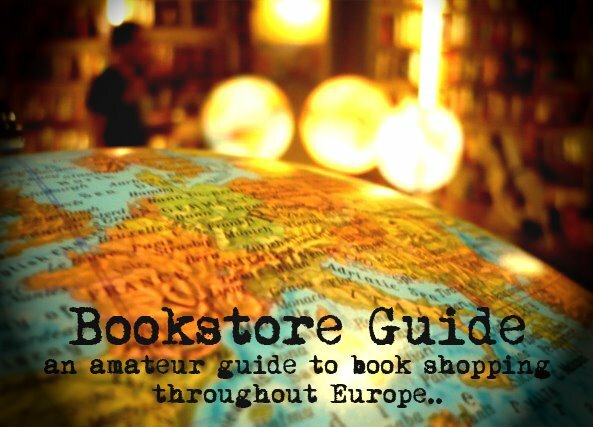 Thanks so much for this, I'll be visiting all four countries during the next weeks and this post has been very helpful - I can't wait to go check out the bookstores! Shakespeare and Sons in Prague and Massolit in Krakow are both some of my favorite places ever. While studying in Prague and teaching in Krakow I found havens in these bookstores. Shakespeare and Sons, especially, was more than a bookstore, it was a cafe, which turned into a place to see and be seen by local poets, musicians and interesting locals. 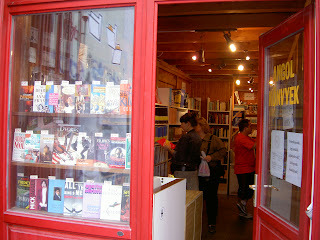 I swear I saw more Czechs there than expats, despite it being an English bookstore. It had cheap beer too, as all bookstores should.